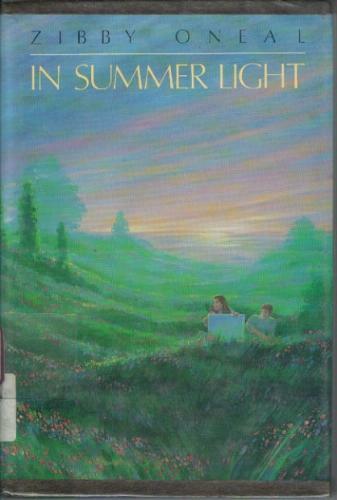 This 1985 coming of age novel is the story of Kate, the daughter of a famous artist, who returns home from boarding school with mononucleosis and must, against her wishes, spend the summer with her family. Most disgusting to her about her stay at home is her father’s attitude toward everyone around him, as though they live to serve his whims. Kate has been subject to this treatment herself, as her father once painted a picture of her, and then dismissed her presence in it, stating that it didn’t matter whom or what was in the picture, because it was the painting style, not the subject, that was important. Kate’s resentment over this and other slights has caused her to stop painting altogether, and it’s also making it difficult to write her paper on the Tempest, since Prospero reminds her so much of her father. The only bright spot in the summer is Ian, the graduate student staying with the family while he researches Kate’s father. Kate admires Ian, and respects his opinion, and before the summer is over, she falls in love with him and with painting all over again. This novel is rather serious in tone, and highly introspective. O’Neal uses beautiful, direct, language to paint very specific pictures in the reader’s mind of each of the characters, Kate’s home, and especially her father’s artwork and attitude surrounding it. Because the narration is in third person, there is sometimes a feeling of distance or disconnection from Kate, but the reader never stops being invested in the story at any point. Kate’s anger toward her father, and her desire to make her own decisions and to have an identity separate from her dad’s create such interesting moments of inner conflict that the reader can’t help but keep reading, if only to enjoy the emotional rollercoaster. Kate’s feelings for Ian also contribute to those ups and downs by adding a layer of tension to the story, and providing the middle ground between Kate’s hurt feelings and her father’s continual cold shoulder. I read a brief “report” on this book in Shelf Discovery: The Teen Classics We Never Stopped Reading, which is what inspired me to read it, but I had no idea I would love it so much. The story is predictable in many ways and follows a certain formula I think many coming-of-age stories adhere to, but every word is so carefully chosen, and there are many gorgeous passages that I actually read aloud to myself so I could enjoy the language that much more. Though it’s cataloged as juvenile fiction in my library system, the only comparisons I could really make in terms of subject matter were to YA titles like That Summer, Up a Road Slowly, and A Separate Peace. I think it would appeal to readers who like those, and I also think it would work well in a classroom setting. There is so much to analyze and so much to learn in just O’Neal’s writing alone. What a disappointment that a book like this is out of print! I can’t name very many contemporary realistic fiction coming-of-age novels, so maybe it’s a genre that has fallen by the wayside in children’s literature in recent years, but this book is so well-written, and really not very dated at all, so it’s hard to believe there wouldn’t still be a market for it. If you can get your hands on a copy, give it to strong readers in grades 5 to 8 who like literary, complex stories about family life, growing up, and moving on.